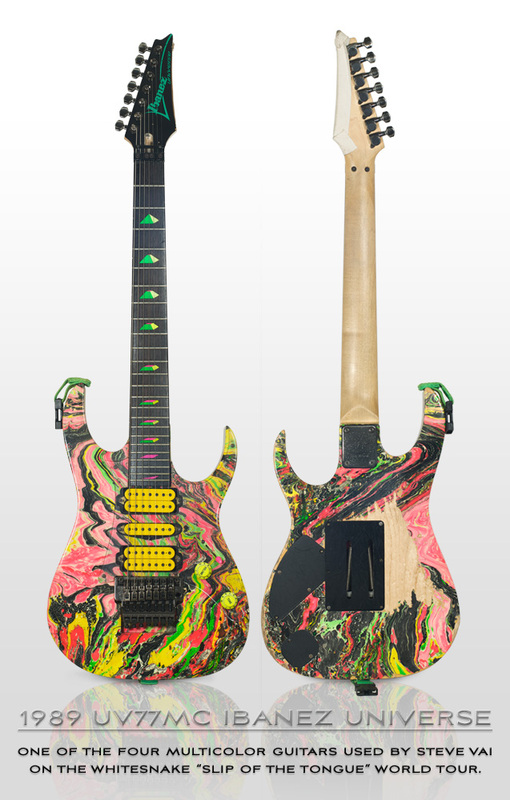 The Guitar Column: Ibanez Universe UV77MC Owned by Steve Vai on eBay! Ibanez Universe UV77MC Owned by Steve Vai on eBay! Hot on the heels of my last owned-by-Steve-Vai post comes this Ibanez Universe UV77MC! This road-warrior was one of the main axes used by Vai on his 1990 Slip Of The Tongue world tour with Whitesnake and, according to the seller, even bears the same strings from the last show! Dagnabbit, I can't get my strings to last two weeks, let alone 20 years. I always knew those string companies were making the good stuff only for their star endorsers. This guitar also comes with the original neon-green DiMarzio strap locks, yellow custom-wound Blaze DiMarzio pickups which replaced the original green ones, and Steve's custom pickholder -- sticky tape attached to the bottom of the headstock. And I'm especially digging the extensive belt-buckle rash at the back of this guitar that goes right down to the wood grain. 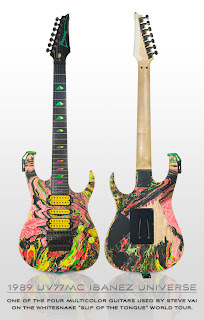 The vid below features Steve Vai playing The Star Spangled Banner on this very same Ibanez Universe, before hurling it at least 10 feet to his roadie at the end! Who was the winner of this guitar?